Capture and edit your important tutorial videos with powerful features. Coursera is a popular education technology company that is backed by a venture and offers massive online courses with open access. This site works with many organisations and universities so that courses can be made online to learners. Some of the top rated course topics on this website are related to computer science, social science, engineering, physics, biology, medicine, humanities, mathematics, digital marketing, business and data science etc. This platform was established in year 2012 and is serving millions of users on active basis. Few courses on this network can be accessed for free whereas for others you may have to make some payment. Courses: It offers approximately 1600 courses and 700 more advanced topics were added to courser library by year 2016. Out of this big list of courses, about 40% are related to business, data science and computer science as well as management field. Some of the most popular courses on this network are holding user base of more than 1 million active learners. Language: If we talk about the offered teaching languages of Coursera online learning platform then you will be glad to know that it offers courses in 8 popular languages: Turkish, Spanish, Russian, Portuguese, French, English, Chinese and traditional version of Chinese language. It assists users to learn from any corner of world without any language barrier..
Types of Courses: The courser platform is recognised for its specialization in all top courses that can range up to 130+. It offers courses from technical side like for engineering professionals as well as serve business world. Other popular topics are biology, medicine and from humanities etc. 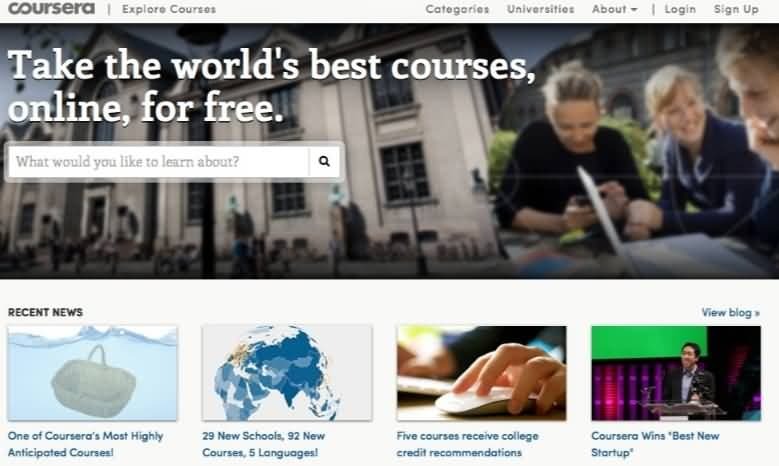 The online learning platform of Coursera is available for individual learners as well as for organizations. If you want to improve your skills with practical grounds then it is advised to go ahead with Coursera. Instructors: Instructors on Coursera are connected from all popular universities and organizations throughout the world. As this platform ensures professional teaching learning environment so users will be able to take guidance from more than 4000 instructors that are expert in various universities at different corners of world. Coursera has 145 plus industry partners. Till now more than 600000 learners have earned course certificates. Many people think that Courseara is the best platform to learn course online based on the following pros. Classes on Coursera platform are open to all learners. Most of the courses on this online learning site are available for free with rich quality content. Instructors of this platform are actually well experienced professors from all different corners of world. They are from 38 countries and working in 128 different universities. Many new partners are about to join this platform in future. New courses are updated time to time. Learners will be able to receive certificates after completion of their course. Most of the courser courses are developed for beginners only. The instructors are available from universities only. The courser courses are more focused on popularity. Pricing Plan for Coursera: How much will you pay for Coursera Course? Recently Coursera has updated its course scheduling and they have now given more focus to on demand type courses. Over the earlier platform, users were able to access courses on the basis on sessions and they use to occur on unpredictable schedules. Thus this new change in site orientation seems to be useful for learners. The courses can be now accessed bi-weekly as well as on monthly frequency. It follows a specific pricing model for specializations. Learners need to pay fee on monthly basis where current fee ranges are between $39 to $89 only. Those who want to purchase specialization need to pay US $373 and they will get access to all five major courses with specialization certificate. Those who want to purchase a specific course need to pay US $79 and it will also offer certificate once learner finish his course. If you want to gain access to full course material on this website then it is also possible but in that case you will not be able to get any certification. The best thing to know is that the monthly course is available with payment of $40.00 and it offers 14 day money back guarantee. These courses offer practical learning material, discussion forums and various graded assignments to boost learning abilities of students. Tips: How to find a course on Coursera? If you are new to this platform and need some assistance for finding new course then you can use coursera search tool as well as cataglog. It will help you to orient results on the basis on your interest. Once you are able to find a course or specialization of your interest then you can view its full details by simply clicking on its title. Using the information page of Coursera users can easily enroll to different courses on this platform. If you want to subscribe for a specialization or course then it can be easily done over official website of coursera. The pricing details are already discussed in above section. There is no doubt to say that Coursera offers valuable content or educators from various fields and provides opportunity to improve skills with valuable resources. The quality of course content is perfect for a beginner. The professors of courser platform offers course material with strategic planning so that learners can stay focused to their desired skill development. It is also possible to get enrolled into multiple courses at a time so that you can optimize your time in best possible manner. Coursera provides courses from top universities with quality content so students can avail opportunity to stay connected with world class professors. The interactive exercises and discussion forums assist in knowledge updates. Coursera offers best connectivity with global student community so that all can grow with rich skill set and can set a bright future ahead.